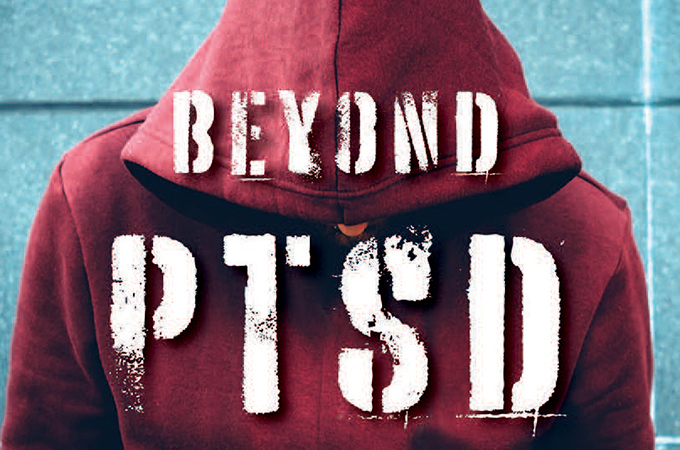 The book Beyond PTSD (cover above), coedited by Patrick Heppell ’03, examines issues that psychologists and psychiatrists typically see in teens, while helping adults understand where these behaviors may come from. As a University of Redlands student, Patrick Heppell ’03 majored in psychology and volunteered as a tennis coach and camp counselor for local teenagers. Now, 15 years later, he is working at New York University Langone Health as a clinical psychologist and professor specializing in child and adolescent psychiatry. Heppell recently took time out of his busy schedule to chat with the Bulldog Blog’s Katie Olson about a book he coedited, Beyond PTSD: Helping and Healing Teens Exposed to Trauma (American Psychiatric Association Publishing); the importance of understanding trauma through looking at the underlying causes of some teen behavior; and how his U of R experiences influenced his career path. Bulldog Blog: What is the premise of your book? Patrick Heppell: Beyond PTSD is comprised of case studies that illustrate typical issues that psychologists and psychiatrists see in teens, such as aggression, irritability, refusal of school, suicidality, defiance, and other concerning behaviors that may have some deeper underlying causes rooted in a trauma history. The book examines these behaviors and helps adults identify and look beyond those behaviors to understand where they may come from. Trauma and stressors often underpin these behaviors, and the book aims to teach adults how to ask teenagers about potential past traumas, and link them to evidence-based mental health services Ultimately, we hope that this information will be shared widely and will help adults link teenagers with appropriate mental health services. BB: What audience are you hoping to reach? PH: The book’s primary audience is the group of people who work directly with children and teens, including family members, educators, social workers, pediatricians and caseworkers that might work in the child welfare system or juvenile justice system. BB: Was there a gap that this book fills? PH: Yes. It’s easy to have a simple explanation for certain behaviors that is met with a simple solution. Treatment often doesn’t work when medical professionals stick to simplistic information, without looking at the underlying factors. My coeditor, Ruth Gerson, MD, and I felt like there was not a book written for a wide audience who want to help teenagers who may have experience trauma. Trauma is, unfortunately, prevalent in many peoples’ lives, and this book aims to provide a better understanding of it. The book goes beyond treating post-traumatic stress disorder (PTSD)—hence its title—and provides a framework for a systemic and collaborative approach to working with teenagers and their communities. BB: How does the book fit in with your professional interests as a psychologist and professor? PH: We sourced case studies from 20 contributors, and each of them is affiliated with a university or medical center yet are clinicians as their primary responsibility This book was a chance for each of us to share our experiences as medical providers and mental health professionals. Teenagers are often over-diagnosed yet undertreated, and this book gave us all a chance to describe what good trauma treatment looks like. BB: When did you develop an interest in childhood psychology? PH: I played tennis in high school and later at the University of Redlands, where I volunteered as a tennis coach and camp counselor for local high school students. I was immediately drawn to the kids who engaged differently than their peers. I took a few psychology classes, and Professors Francisco Silva and Fred Rabinowitz were incredible mentors and role models for me. They provided me with information on child psychology and mental illness. After graduating from the U of R, I knew I wanted to go to graduate school but I wasn’t sure what I would study. I took a job at an intensive day treatment program in Hawaiian Gardens, California, where I worked with kids with all kinds behavioral issues. The one commonality between them is that they all had experienced trauma and loss. After two years in that position, I knew I wanted to be a child psychologist and pursued a doctoral degree in family psychology. Learn more about Patrick Heppell, the book Beyond PTSD: Helping and Healing Teens Exposed to Trauma, and U of R’s psychology major and Community Service Learning.